The Internet has been hailed as an unprecedented democratizing force, a place where everyone can be heard and all can participate equally. But how true is this claim? In a seminal dismantling of techno-utopian visions, The People's Platform argues that for all that we "tweet" and "like" and "share," the Internet in fact reflects and amplifies real-world inequities at least as much as it ameliorates them. Online, just as off-line, attention and influence largely accrue to those who already have plenty of both. What we have seen so far, Astra Taylor says, has been not a revolution but a rearrangement. Although Silicon Valley tycoons have eclipsed Hollywood moguls, a handful of giants like Amazon, Apple, Google, and Facebook remain the gatekeepers. And the worst habits of the old media model—the pressure to seek easy celebrity, to be quick and sensational above all—have proliferated on the web, where "aggregating" the work of others is the surest way to attract eyeballs and ad revenue. When culture is "free," creative work has diminishing value and advertising fuels the system. The new order looks suspiciously like the old one. We can do better, Taylor insists. The online world does offer a unique opportunity, but a democratic culture that supports diverse voices and work of lasting value will not spring up from technology alone. 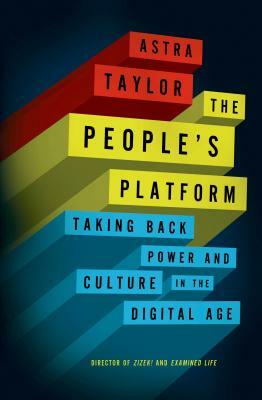 If we want the Internet to truly be a people's platform, we will have to make it so. Astra Taylor is a writer and documentary filmmaker. Her films include Zizek!, a feature documentary about the world’s most outrageous philosopher, which was broadcast on the Sundance Channel, and Examined Life, a series of excursions with contemporary thinkers. Her writing has appeared in The Nation, Salon, Monthly Review, The Baffler, and other publications. She lives in New York City.